System that gives you information on the journey in progress (range, fuel consumption…). Press the button, located at the end of the wiper stalk , to display the various items of trip computer information in succession. The next press then returns you to the normal display. Press the control for more than two seconds to reset to zero the distance travelled, the average fuel consumption and the average speed. Temporary display in a new window. Cycle through the information with successive short presses on this button. Depending on your vehicle's equipment, the trip computer information appears in the multifunction screen or on the central screen in the instrument panel. Press the up and down arrows on the instrument panel navigator , associated with Peugeot Connect Media Navigation (NG4 3D), to cycle through the information. Pressing the button again takes you to a black screen. A further press returns you to the normal display. 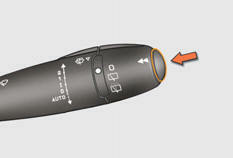 When the trip required is displayed, press the button on the end of the wiper stalk for more than two seconds. When the required trip is displayed, press the "OK" button on the instrument panel navigator , associated with Peugeot Connect Media Navigation NG4 3D), for more than two seconds. Trips "1" and "2" are independent but their use is identical. For example, trip "1" can be used for daily figures, and trip "2" for monthly figures. This indicates the distance which can still be travelled with the fuel remaining in the tank in relation to the average fuel consumption over the last few miles (kilometres) travelled. This value may vary following a change in the style of driving or the relief, resulting in a significant change in the current fuel consumption. When the range falls below 20 miles (30 km), dashes are displayed. After filling with at least 5 litres of fuel, the range is recalculated and is displayed when it exceeds 60 miles (100 km). If dashes are displayed continuously while driving in place of the digits, contact a PEUGEOT dealer or a qualified workshop. This is the average fuel consumption during the last few seconds. This function is only displayed from 20 mph (30 km/h). This is the average fuel consumption since the last trip computer zero reset. This is the average speed calculated since the last trip computer zero reset (ignition on). This indicates the distance travelled since the last trip computer zero reset. This is the distance remaining to be travelled to the final destination. It is either calculated instantly by the navigation system, if guidance is activated, or entered by the user. If the distance is not entered, dashes are displayed in place of the digits. 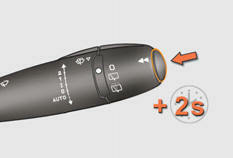 If your vehicle is fitted with Stop & Start, a time counter calculates the time spent in STOP mode during a journey. It resets to zero every time the ignition is switched on with the key.